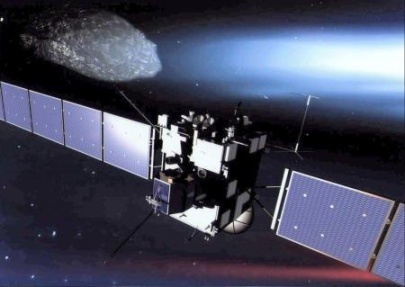 Rosetta, an 11 year trek to the heart of a comet! Comets are thought to represent icy fragments of part of the "builder's rubble" left over from the construction of the solar system, and as such their study can provide vital clues to the formation of the planets and the evolution of the Earth itself. As a result, several nations have launched a series of missions to study these 'dirty snowballs' including STARDUST, CONTOUR and the VEGA spacecraft. Building upon their experience of sending spacecraft to study comets, in particular the pioneering Giotto mission to Halley, the European Space Agency (ESA) has funded a new and ambitious probe, called ROSETTA, that launched in 2004 and is on a 10-year journey to Comet Churyumov-Gerasimenko. The original target of this mission was Comet 46P/Wirtanen, a short period comet with an orbital period of just under 6 years, which was discovered in 1948. But because the launch of Rosetta was delayed, a new target had to be selected. In contrast to Giotto, which was a close approach flyby mission, Rosetta will actually enter orbit around the target comet and dispatch a small lander onto its icy surface. The Rosetta hardware actually consists of two main components, a boxlike main spacecraft orbiter bus which includes the communications, power and propulsion systems, as well as the orbital science payload, with a separate lander, called RoLand, which will descend to the surface of the comet and conduct in situ studies of the nucleus. The main orbiter is very similar in design to the Mars Express spacecraft, the common design and manufacturing processes greatly reducing costs and build time. 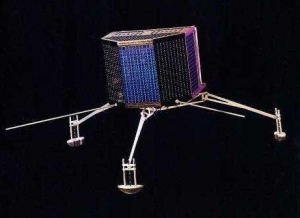 The lander is a nifty 100kg package of science instruments designed to return the first ever data direct from the surface of a comet's nucleus. However there are also some significant differences in the spacecraft resulting from the much longer and more complex mission profile being undertaken by Rosetta. These include large solar panel arrays to provide adequate power for the spacecraft when it is far from the sun, at times up to 675 million km, where the sun is 20 times fainter than in Earth orbit. A highly sensitive and accurate communication system is required to maintain contact with the Earth at such long distances and to transmit the large volumes of scientific data from the 11 scientific instruments on board. In addition, the onboard computer system has to be smart enough to handle this complex suite of instruments, navigate the spacecraft when the communications time lag with Earth is too great to allow control from mission control, and also to monitor the onboard systems while the probe is hibernating on its long cruise to Comet Churyumov-Gerasimenko. The main orbiter carries a set of 11 scientific instruments, from US as well as European research teams, divided into 6 suites dealing with different aspects of the science mission. The imaging and remote sensing instruments, which will study the comet in the visible, UV, IR and microwave spectral bands (ALICE, OSIRIS, VIRTIS and MIRO), are complemented by instruments which will measure the composition of the comet, its dust and gas (ROSINA, MODULUS,COSIMA and MIDAS). The other instruments will look at the structure of the nucleus (CONSERT), the dust flux (GIADA), plasma environment (RPC) and carry out radio studies (RSI). All the instruments are fitted to the top deck of the orbiter, which will constantly face the nucleus of the comet during the orbital phase of the mission. The lander is also carrying a suite of 10 instruments to study the surface and composition of the nucleus, including a small drill (SD2) to obtain samples from below the surface. Rosetta weighed a chunky 2.9 metric tons at launch, with over 50% of the mass being onboard propellant to keep the spacecraft moving throughout its long mission, particularly during the delicate and complex maneuvers in orbit around the comet nucleus. In addition, Rosetta must also climb up out of the plane of the ecliptic to meet its target. As a result, ESA will use Europe's most powerful launcher, the Ariane 5 to boost Rosetta towards its destination. Even then the flight will also used a gravity assist flyby of Mars and three similar flybys of Earth. Rosetta is currently in deep space hibernation during this leg of its long travel and will remain that way until January 2014. The comet rendezvous will occur in May 2014 with mapping scheduled for August 2014. Once in orbit, mission control will refine the course of the spacecraft using images sent back by the probe to move Rosetta into a tighter orbit, as close as 2km above the nucleus, to provide the most detailed views yet obtained of a comet. Once detailed mapping has been completed and a landing site selected, Rosetta will release the lander, which will descend onto the surface and secure itself in position against the comets feeble gravity using a harpoon fired into the surface. The lander will operate for at least a month, transmitting its data back to Earth via the orbiter which will continue to observe the perihelion passage of the comet until the expected end of the mission in December 2015. Named after the Rosetta Stone, the key to unlocking the secrets of ancient Egypt, it is expected that the modern Rosetta will prove instrumental in unraveling an even older mystery, the birth of the Solar System.